Lemon GreenTea: OPPO F3 emerges as the No.1 smartphone for the price band of Php15,000 to Php20,000 smartphones, with a dominating 48.5% market share. 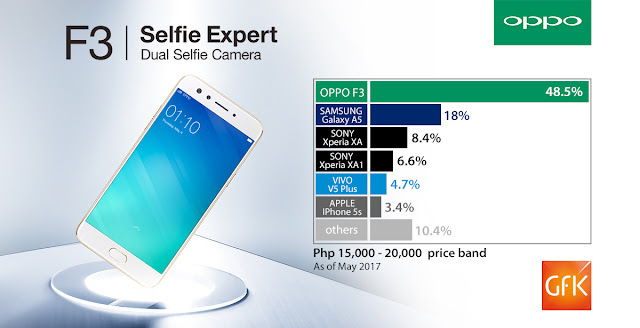 OPPO F3 emerges as the No.1 smartphone for the price band of Php15,000 to Php20,000 smartphones, with a dominating 48.5% market share. "The OPPO F3 is a well-received smartphone since the beginning, our competitive package, sleek design and trending dual selfie camera setup are the reasons why it is successful.” said Stephen Cheng, OPPO Philippines Brand Marketing Manager.